Unfortunately, your registration has been declined by the auctioneer. You can contact the auctioneer on 818 495-3038 for more information. You are the current highest bidder! To be sure to win, come back on 07 Feb 2018 09:18 PST (17:18 GMT) Date Format as the lot closes or increase your max bid. 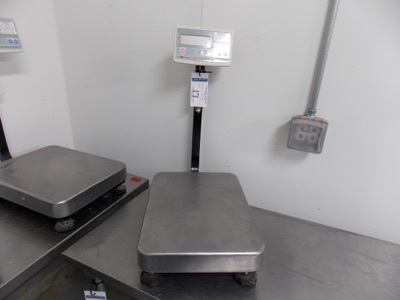 150 Lb Capacity Scale | Digital Platform Scale, 150lb. Cap | MODEL# FG-60KAL | SERIAL# Q1912245 | * Skidding and load out at market rate will be charged at your convenience. For Chris Hillseth Enterprises delivery information please telephone 818 495-3038. REGRET? MISSED OPPORTUNITY? JUST MISSING THAT CHANCE? Don’t let this 3 DAY SALE be the way you start the new year. Quest Nutrition, the leader of the protein bar market has closed all of their production facilities, selling the entire line of food production equipment in a Really Big Sell. 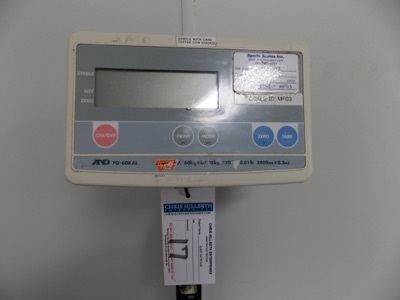 Never has there been an auction this size with so many new and slight used high-quality equipment on Bidspotter. There are items for every level of food production and/or manufacturing. Food processing equipment consists of manufacturing tools for the production of nutrition bars, wafers, cookies, potato chips & protein bars. Complimentary pieces like weight scales, x-rays, baggers, conveyor systems, shrink wrappers, pallet transportation equipment, forklifts, engines, pumps, mixers, etc… can satisfy the needs of all industries. 1. Only Checks, Wire Transfers or Cashiers Checks payable to Chris Hillseth Enterprises will be accepted for payment. No equipment will be removed from the sale site until payment is received by Chris Hillseth Enterprises. NO EXCEPTIONS! 2. While descriptions are believed to be correct, the sellers agent or the owners make no warranties or guarantees expressed or implied, as to the genuineness, authenticity of, or defect in any lot and will not be held responsible for advertising discrepancies or inaccuracies. Everything sold AS IS and WHERE IS except as expressly made in writing. No warranties are made as to the merchantability of any items or their fitness for any purpose. 3. International bidders (outside of the United States) require a $10,000 earnest-money deposit. This is non-negotiable and accounts for 5% to 10% of the purchase price (depending on the total gross dollar amount of the winning bid(s) of the purchase. Not including taxes). This money is held by the seller's broker to be used as a credit toward the down payment and closing costs. 4. Purchaser hereby agrees to defend, indemnify and hold harmless Seller its directors, officers, employees and other agents and representatives from and against any and all liabilities, judgments, claims, settlements, losses, damages, penalties, obligations and expenses, including attorney`s fees and expenses and other professional fees and expenses, incurred or suffered by such person arising from, by reason of, or in connection with any loss, damage or injury to person or property arising from, by reason of or in connection with the Goods sold hereunder. This indemnification shall survive delivery of the Goods to Purchaser and any subsequent sale or other transfer of the Goods to a third party. 5. It is the buyers’ responsibility to secure all safety equipment to meet all applicable government safety standards in using or removing items purchased. 6. Sales Tax will be added to the purchase of all taxable items. Dealers who purchase for resale must file their resale permit numbers. If sales tax is not collected at the time of sale and is deemed “needed to be paid” at a later date, buyer agrees to pay all required taxes. 7. Purchaser does hereby indemnify and hold harmless auctioneer and seller from any and all damages, claims or liabilities from injuries to persons or property of any type whatsoever caused during the sale or by the removal of items purchased. 8. Sellers agent and Seller shall have no liability to the purchaser due to non-delivery of any item for any reason other than to return to the Purchaser the monies deposited for non-delivered items. 9. In the event the purchaser fails to pay the whole of the purchase within the time set forth by the auctioneers and/or fails to comply with any of the conditions or terms of sale, the seller may retain and/or recover the deposit specified as liquidated damages and, in addition thereto, items that are not paid for can be resold at public or private sale without further notice. Any deficiency resulting from such resale shall be paid to the auctioneers by the defaulting purchaser together with all charges, fees, and expenses incurred by such resale and enforcement of the obligation hereunder. 10. The Bidder becomes solely responsible for all items purchased by him immediately following his winning bid at the auction. Therefore, he is advised to further guard and insure his items at his own discretion. 11. No item can, on any account, be removed before buyer receives payment in full. Removal shall be at the expense, risk and liability of the purchaser. Auctioneers shall not be responsible for items not removed within the time allowed. If equipment is not removed within specified removal time, purchaser shall be liable for any moving and storage costs incurred and, if not so removed, the items shall be deemed abandoned. 12. If any shortage exists on estimated counts, an adjustment will be made if claims are made at time of removal. No adjustment will be allowed after items are removed from the premises. 13. If any dispute arises between two or more bidders, the sellers’ agent may or may not put the lot up again at once, and resell. 14. The sellers’ agent, when acting as agent only, is not responsible for acts of its principals. 15. A 18% Buyers premium will be applied to all sales in Addition to Applicable Local and State Sales Tax. 16. By accepting a sale listing catalog and signing this form the buyer agrees to these terms and any announced terms at the sale. 17.You will receive notifications from us regarding your purchases. 18. Seller reserves the right to accept or reject any and all bids. 19. All Bills must be completed on Day of Sale unless arrangements are made with Auction House prior to bidding. 20.Full Payment at Termination of Sale. 21. A 3% fee will be applied to all CC orders. 22. Skidding and Load out charges: There will be loading and skidding charges added to your purchase at market rates. Various Locations, call for specific item.